Just curious, why would you not consider Smoky as a parent? For me, its hardiness out here, color, and fragrance have always made it a favorite, and this year I used it on almost everything. Beautiful rose! Can't wait to see how it matures. I do love the black tints it takes on the edges of the petals. 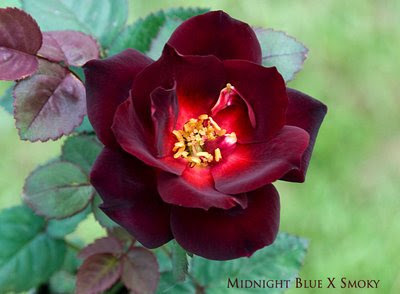 Does it burn in the sun like some other black tinted roses? I am considering putting Little Chief on Midnight Blue. I think that could produce something pretty cool.